6.09 points at 23 votes (rank 620). 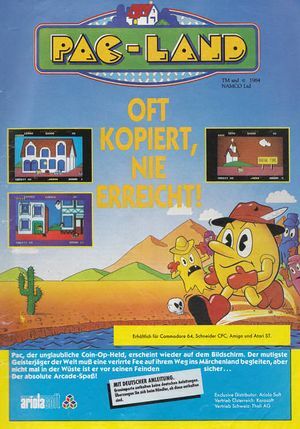 The Jump & Run game Pac-Land, known through its arcade version (1984), was published also in the C64 in 1987. On his travel he needs to cross towns, woods, mountains and deserts, in which all kinds of perils lure. Additionally, he is chased by his eternal enemies Blinky, Pinky, Inky and Clyde. If he makes it to get to Fairyland, the fairy gives him in thanks a pair of magic shoes that allow Pac to fly. Now he has to cross Pac-Land anew into the other direction to get back to his family. When he has arrived there he made the trip and can help another fairy. The game contains altogether 4 trips with each 4 levels. After that the game starts again with the first level. There are no extras such as helmet, warp, invulnerability, etc. To walk fast, the joystick or the key for the direction needs to be press twice in the same direction. To jump far from a platform, the joystick or the key for the direction needs to be pressed several times consecutively and fast into the desired direction during the jump. Yellow energy pills turn the enemies into small ghosts for a short time, which then can be eaten by Pac. Landing on some objects can man additional fruits appear. 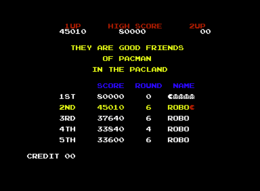 The version by Remember offers next to the manual and a highscore list saved to disk also the following cheat modes: unlimited lives, collision query off, keys are not needed in round 14. If you press the keys [S], [T] and [G] during the game, you can run three times as fast and jump better over obstacles and cars. H.T.W: "Pac-Land was played by me extensively on the machine and as soon as the C64 version was released, I added it "to my collection". Interestingly, the C64 version is a bit easier to play, regardless that almost all features of the arcade version have been taken over. 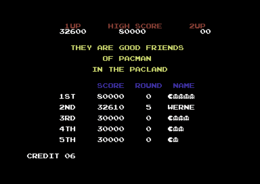 And as everything that looks like Pac Man has a bonus, I also like this version...". 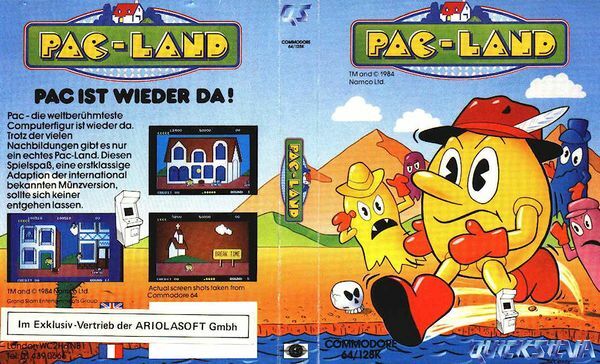 Pac-Land in the Killer List Of Videogames. This page was last modified on 26 March 2015, at 22:36.